This manifolding set was designed by us in T304 stainless steel to specifically deal with the now popular M50/S50 engine conversions into the E30 chassis, and the increased volumes of exhaust gases created by these high-revving, multi-valve units. We have tested this product up to 700 bhp on force inducted S50 engines without any flow restrictions. This product is special order only. 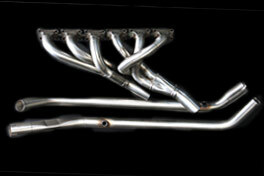 Manifolding sets for the M50 / S50 engine conversions into the E21chassis are also available on request.